I work on marine organisms, populations and ecosystems. I like research that are mechanistic, quantitative and driven by theory, and my favourite animals are fish and zooplankton. Environmental gradients in space and time create trade-offs between growth and survival, and organisms are well adapted to move along these slopes. Behavioural decisions have far-reacing consequences to for example recruitment processes and ecosystem functioning. 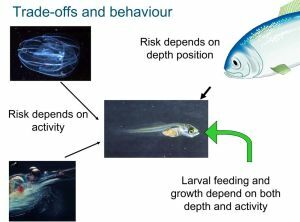 As an example, both feeding success and death rates of a larval fish depends on its activity level and where in the water column it prefer to be. I find it intriguing to apply evolutionary models to predict where animals should be found in these gradients. Reglero P, Ortega A, Balbin R, Abascal FJ, Medina A, Blanco E, de la Gándara F, Alvarez-Berastegui D, Hidalgo M, Rasmuson L, Alemany F, Fiksen Ø. 2018. Fiksen Ø, Opdal AF. 2015. Fouzai N, Opdal AF, Jørgensen C, Fiksen Ø. 2015. Fiksen Ø, Follows MJ, Aksnes DL. 2013.